After an eight hour drive to Disney World (seriously, whose genius idea was that?) we finally arrived at Disney Springs, tired, haggard, weary and absolutely ravenous. After parking in the lime garage at Disney Springs, no easy feat on a Friday night, we made our way to The Polite Pig. 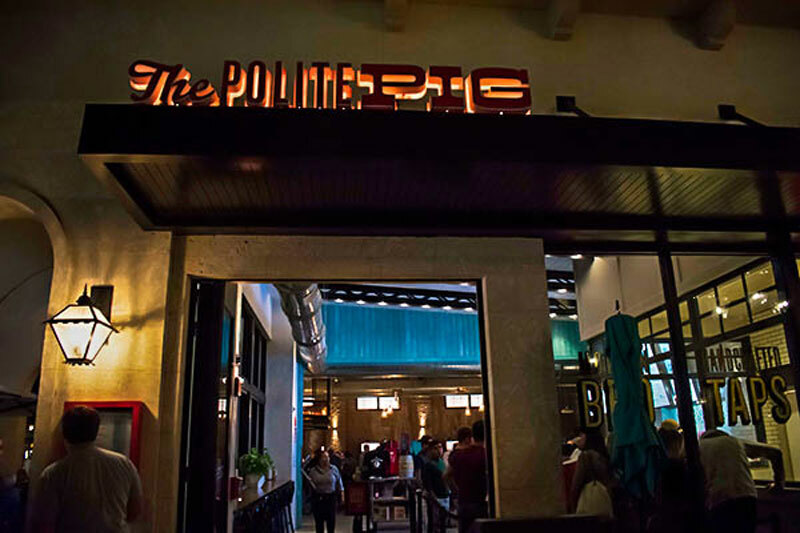 The fourth Orlando-area restaurant of husband and wife team James and Julie Petrakis, The Polite Pig features modern barbecue prepared in an open kitchen, Southern-inspired sides and desserts, a barbecue sauce bar and a bourbon bar with more than 50 varieties of bourbon available. You place your order at the counter, quick-service style, and your food is delivered to your table. When ordering, I resisted the urge to order from a robust selection of inspired sides like BBQ Cauliflower with paprika sour cream, Crispy Brussel Sprouts with whiskey caramel, and Southern Potato Salad with creamy herb dressing, pickles, egg and celery. You can check out the full menu here. Knowing we would be spending the next several days noshing on items at the Epcot International Food and Wine Festival, I decided, shockingly, to go with something “light” that still gave me a little taste of barbecue. While we waited for our food, I took time to visit the sauce bar. Our food arrived at our table and we were in for a real treat. Polite Caesar Salad – Romaine, Parmesan, Cornbread Croutons, and Carrots – $12*. I chose to add brisket to the salad for an additional $8. I wish there was something in the photo to give you a sense of scale with the salad, but it was MASSIVE. It came already dressed and tossed, and was the perfect balance of light dressing with crisp, cold greens and croutons. 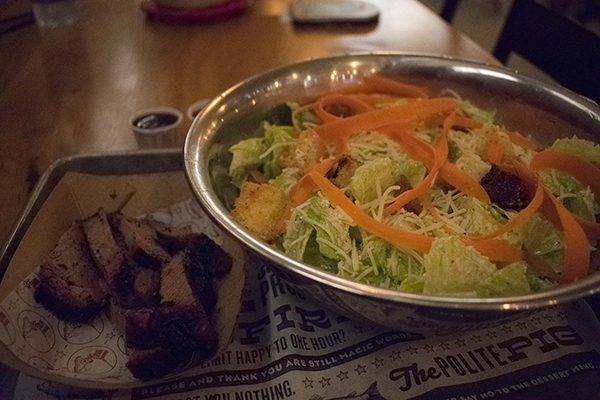 The salad on its own wasn’t all that memorable; the brisket was very tender and flavorful. I enjoyed each of the sauces with it. I really wish they would have worked some barbecue flavor into the Caesar dressing and tossed the brisket along with the salad. I alternated eating the salad on its own, and adding in pieces of brisket dipped in sauce. It was definitely better with all the components and a little barbecue sauce together. Layla’s Sweet Sauce – “The tomato-based sauce gets it sweetness from molasses, honey and brown sugar” with a touch of cumin. Thomas’s Southern Gold – Mustard and vinegar-based, German-inspired sauce. 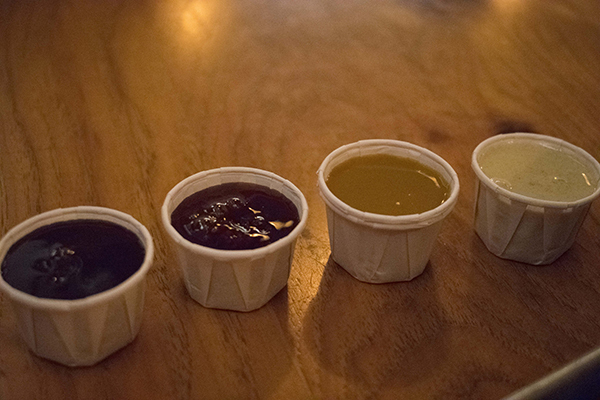 I actually loved all of the sauces, and they are each a very unique representation of traditional barbecue throughout the country. My personal favorites were Thomas’s Southern Gold and the BBQ Ranch. We also sampled The Southern Pig Sandwich – Pulled-Pork, Fennel-apple Slaw, tangy Mustard BBQ and Duke’s Mayo. Served with a Pickle Spear – $12* with a side of Sweet Potato Tots – parmesan cheese – $6*. I was able to sneak a little taste and enjoyed this even more than my salad. The fennel-apple slaw was vinegary and paired wonderfully with the natural sweetness of the pork. For anyone who grew up on traditional Southern barbecue sandwiches like I did, this will bring back all those components, but in a very elevated, sophisticated way. The sweet potato tots were hot, crispy on the outside and fluffy on the inside. The parmesan cheese added a sharpness which was needed to make these a savory side vs. a makeshift dessert. 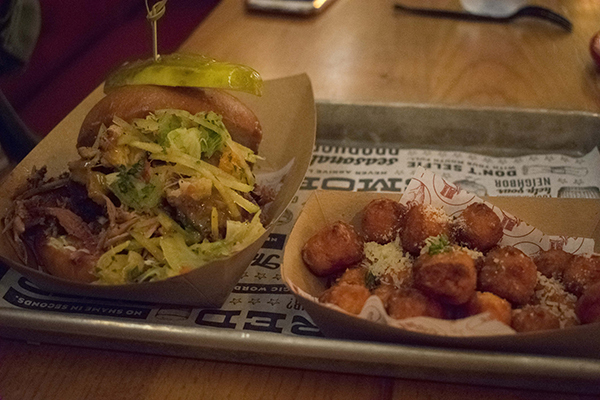 The Polite Pig brings something that Disney property has been missing for a long time — classic, delicious, Southern barbecue staples — and adds in a unique, modern spin. Despite dining here at almost 9 o’clock, the place was still packed with a substantial line at the counter. The quality of the ingredients speaks for itself and I could probably go back 5 or 6 times and try something new each time. For those on the Disney Dining Plan, the place is a great value as a quick-service credit. 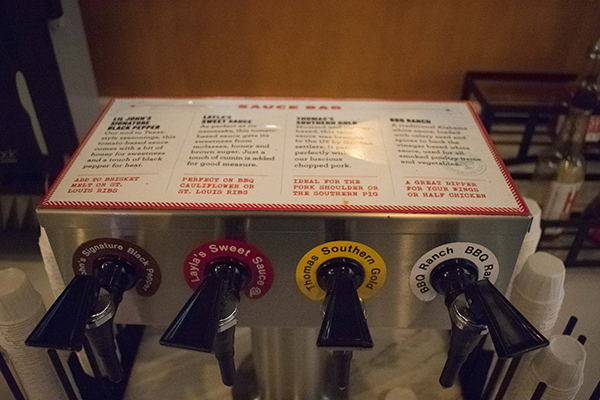 What’s your favorite menu item at The Polite Pig? *Menu prices are current as of time of publication, but are subject to change. Can You Make Reservations for Quick Service Meals at Walt Disney World? Why Are Walt Disney World Burgers Generally So Horrible?